Back in the fall, we announced our NEW SPA MENU! With so many new facial services, we’re spotlighting a facial service each month. From what to expect to benefits, we’re covering it all. 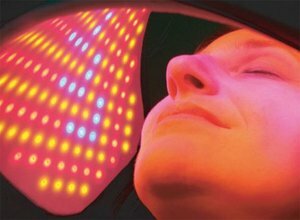 This month we’re shining the light on the Oxygen Facial with LED. This 75-minute “red carpet glow” facial ($150) is perfect for weddings, events, and special occasions! Not only does this treatment encourage the growth of new cells and collagen, but it may also rejuvenate skin that has been exposed to pollutants and other toxins that starve cells of their oxygen. LED Therapy uses Red, Blue, Yellow, or Green light to treat targeted concerns. For example, Red light therapy reduces inflammation and promotes circulation, while Blue light therapy helps kill bacteria that can lead to breakouts. Also LED therapy can be added to other facials like the La Belle Visage Facial (with 20 minutes of LED therapy) as seen in this video. Oxygen facials and LED therapy naturally increase the skin’s metabolic process to repair and regenerate. And it’s non-invasive, which means there’s no recovery time. Get ready to glow with no downtime. To keep up the results from this facial, consult with your aesthetician to see which Sorella Apothecary products will be most beneficial for your targeted skin concerns.